Oahu’s infamous North Shore is known as such for good reason and definitely should be on your bucket list if you’re visiting the island. Leave town early in the morning (before 9am) to avoid the inevitable traffic that builds up later in the day. Make a pit stop in Wahiawa for a quick drink (the coffee is excellent at Surfers Coffee Bar; refreshing lemonade paired with local fruits in super-cute Mason jar cups can be found at Wow Wow Lemonade), dessert (Kilani Bakery and Sunnyside Bakery both have amazing pies and other sweet delicacies), or a full on meal if you’re so inclined (Dong Yang Inn is a hole-in-the-wall eatery that has delicious meat jun -- flavorful egg-battered strips of thin meat). Continue on HI-803 and if you need more sugar, check out Paalaa Kai Bakery’s snow puffies -- a yummy delight, a hybrid of puff pastry and a cream puff! During the winter months, Waialua is home to Dupont Pioneer’s sunflower fields -- endless rows of bright, cheery sunflowers, perfect for that perfect Instagram shot. Call (808) 637-0100 ext. 149, or email waialuasunflowers@pioneer.com to find out when the scheduled public tours will be held. By the time you make it to Haleiwa it should probably be around lunchtime -- if you like Thai food, Opal Thai has the best on the island, complete with great food recommendations by Opal himself. If you are craving something cold and refreshing, Haleiwa Bowls are beautiful and tasty. And now, which beach to choose? Top picks for the summer months -- Shark’s Cove or Ke Iki Beach for great snorkeling. Top spots to watch pro surfers attack the large waves during the winter months -- Pipeline or Waimea Bay. Rather get a little sweaty? 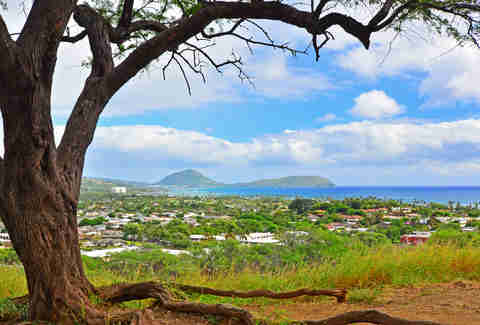 Ehukai Pillbox hike is a quick hike that offers amazing views of the shoreline! Since you’re already out there, just make a day out of it and stay until sunset. Pick up dinner from Ted’s Bakery which offers simple, local favorites, and an amazing assortment of pies. Any of the beaches offer that stunning Hawaii sunset, but Sunset Beach is our number one place to savor that magical feeling at the end of a spectacular day. The beaches on the Westside of Oahu are pristine, beautiful, and are great places to visit to get out of the crowded city. Once again, starting early in the morning (before 9 am) is key to minimize the time spent in your car in maddening traffic. On your way out there, eat breakfast at Countryside Cafe in Waianae -- portions are generous and the food is get-in-yo-belly good. The Corned Beef Hash Local Moke-o is outta this world, and you can’t go wrong with any/all of the Omelet options. Once you’ve fueled up, head all the way out to the end of the road, Kaena Point, for a nice nature walk right along the ocean. Complete with tidepool explorations, and hopefully lots of wildlife sightings (it’s a bird sanctuary and also a great place to see Humpback whales in the early months of the year). If you prefer a slightly challenging but quick hike with a sweeping overlooking view of the coastline, Upper Makua Cave is a fun choice. After breaking a sweat, take a dip in the ocean at nearby Yokohama Bay or Makua Beach. Sometimes you may see the spinner dolphin pod that tends to hang out around there! Start driving back East and have a light lunch at HI Cravings in Kapolei. It has delicious acai bowls with fun toppings like cookie dough balls and stuffed strawberries. Sneak in some additional suntanning action by heading to the lagoons at Koolina. The furthest lagoon (#4) has the most public parking spots available, and it’s easy enough to walk to the other ones if you so choose. By now you’ve probably built up a big appetite from being so active in the sun, so we recommend going to happy hour at Monkeypod Kitchen (3 - 5:30 pm daily) for great food and drink specials, and live music by local artists starting at 3:30pm. And definitely save room for dessert -- Monkeypod’s pies are out of this world. After dinner, head back over to the lagoons and catch the sunset! If you’re looking for a less time consuming itinerary (or just want to sleep in a little bit later), Kaneohe is much closer to town and takes less time to get to in comparison to some of the other locations on this list, but still has some unique experiences that are not to miss out on! 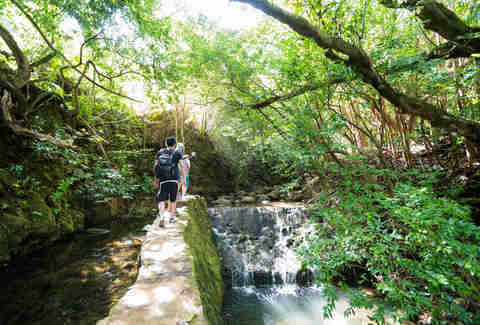 Leave town no later than 10 am and choose from two quick waterfall hikes in the Nuuanu area -- Judd trail (aka Jackass Ginger) or Lulumahu Falls. Both are muddy and fun, but be sure to wear bug spray to avoid being eaten by all the mosquitoes! It’s about a 45 minute drive, but well worth it, to Waiahole Poi Factory which is located a little past Heeia. Super ono Hawaiian food and fresh, fresh poi -- combo plates are the way to go so you can eat a little bit of everything! We usually order the side haupia, because one little square of that sweet, coconut creamy goodness is just not enough. 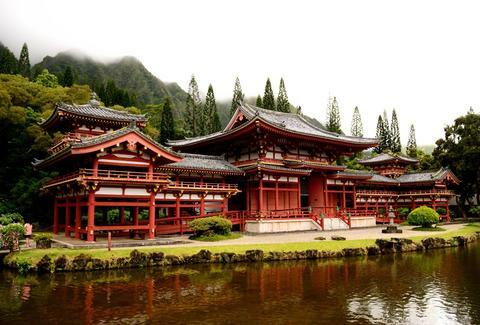 Next, get your Zen on and go to the Byodo-In temple in the Valley of the Temples Memorial Park in Kaneohe. An amazing temple and beautifully-kept grounds, with the Koolau mountains as a backdrop -- it’s the perfect place to take some time to reflect and appreciate life. Open daily 9 am - 5 pm, with admission being only $3 for adults, $2 for senior citizens, and $1 for children. Finally, wrap up this nature-filled day by checking out the Hoomaluhia Botanical Garden, a scenic and lovely place to enjoy plants from various geographical regions (e.g. Philippines, Malaysia, India, Polynesia, and Africa, just to name a few). Open daily 9 am - 4 pm, free admission, and on the weekends (10 am - 2 pm) they have a catch-and-release fishing program -- they provide bamboo poles and barbless hooks, you bring the bait! Start your day around 9 am (before it gets too too hot) and get on over to Hawaii Kai. Pick your poison -- Koko Head (a steep “hike” up, and then subsequently down, tons and tons and tons of stairs), Hanauma Bay Ridge (starts off paved, then you can explore on some of the well-worn dirt paths, but remember -- safety first! ), or Makapuu Lighthouse Trail (all pavement, family & dog friendly). Enjoy the extremely beautiful shoreline view while driving to Ai Love Nalo, located in Waimanalo. Fresh and delicious salads, bowls, juices, and smoothies using local products whenever possible. The Kaukau Luau plate showcases the veggies in a Hawaiian style, and is absolutely amazing. Sandy Beach is a fun spot -- watch daring bodyboarders take on the close-to-shore break, hang out on the sand, explore the tide pools, or watch the kite fliers take advantage of the typically windy conditions. After all that, there are tons of great places to eat at on the way back into town. Design your own pizza at Sophie’s Gourmet Hawaiian Pizzeria for some satisfying warm carbs-cheesy goodness! BYOB + delish Greek food at Olive Tree Cafe in Kahala. Or stop by Kaimuki and choose from a plethora of awesome restaurants (e.g. Himalayan Kitchen, Hale Vietnam, or To Thai For). Amanda Zen is a freelance writer for Thrillist who loves all sides of Oahu!